Although the absence of Jeurys Familia loomed large for the Mets, the bullpen didn’t end up being as much of a concern as many of us expected for the first several innings of the Mets’ first game of the season. Although Hansel Robles pitched a perfect inning to relieve Noah Syndergaard in a 0-0 game, by the time Fernando Salas came in the game was well in hand. Fifth starter Robert Gsellman closed the game, presumably on his throw day, to avoid using an additional reliever to finish off a game that was already over. This was a three-part story: first, the Mets’ productive batters; second, the Braves’ depressing bullpen; and third, bullpen pitchers stepping up. Asdrubal Cabrera hit in 3 of 5 plate appearances and stole a base, totaling a .191 increase in the Mets’ win probability. That was more than double the next best Mets hitter, the surprisingly patient Jay Bruce, who added .073 win probability going 0-1 with three walks. Bruce currently has a .750 OBP and a .000 batting average, but he’s never been much of a walker: his OBP-BA split was .059 last year and has hovered between .06 and .07 for most of his career. As soon as Julio Teheran handed the reins to lefty Ian Krol in the seventh inning, things started to unravel. Catcher Rene Rivera singled, followed by pinch hitter Wilmer Flores getting on via fielder’s choice and swiping second, Jose Reyes walking, and Cabrera driving Flores home. In a weird matchup decision, righty Chaz Roe came in and walked Yoenis Cespedes, only to be immediately lifted for lefty Eric O’Flaherty to face Curtis Granderson. A sac fly later, Reyes was home. The aptly-named Neil Walker took first on balls after Cespedes stole second. Bruce walked to force Cabrera in, Lucas Duda doubled the bases clear, and Travis d’Arnaud walked. Jose Ramirez came in to pick up the pieces, and despite a passed ball by Tyler Flowers, he coaxed a groundout from Flores to end the six-run, four-walk inning. O’Flaherty had a difficult 2016, and despite being a left specialist, he was nothing special against either group of batters: he allowed lefties a .288/.329/.439 slash line, and his numbers against right-handers were even worse. Hansel Robles and Fernando Salas both acquitted themselves admirably, Salas with two strikeouts and Robles with two groundouts and a K. Those two groundouts are key for Robles, who struggles with the longball. He allowed 7 homers in 77 2/3 innings with around a .44 ground/fly ratio on a close-to-average .308 BAbip. In a small park like Citi Field, that low ground/fly is a dangerous number, so it was great to see him keeping the ball down. The Mets are idle today and line up against Bartolo Colon on Wednesday. Expect a similar bullpen, with Robles in high-leverage situations to keep closer Addison Reed fresh, and probably expect to see Reed either way. Is there anyone else you want up with the bases loaded?! 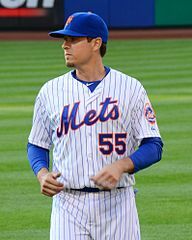 Including last night, Kelly has made six plate appearances as a Met with the bases loaded. In those appearances, he’s 2 for 6 with a 1.000 SLG: the expectation is that he should get exactly one base. As a team, the Mets hit .245/.242/.436, pretty abysmal; MLB in general hits .264/.299/.414. The Mets’ lower on-base percentage and higher slugging average indicates that hits are comparatively rare but are more likely to go for extra bases than the league as a whole. Kelly is better than other Mets and better than the league. 24 Mets have appeared with the bases loaded; 14 have hits. Justin Ruggiano hit a grand slam in his only appearance; Travis d’Arnaud hit singles in both of his and Alejandro De Aza is 3-4. The next three OBP leaders are David Wright, Lucas Duda, and Neil Walker, all of whom are out for the season. James Loney comes in at a .286 OBP, followed by Wilmer Flores and Yoenis Cespedes at .250, before things get ugly. Travis hit .333/.556/.333 last year in 9 bases-loaded appearances; Cespedes was 2-5. So is there anyone else you want up? 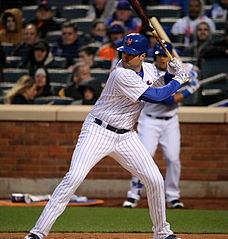 Maybe d’Arnaud – I still believe if he stays healthy he’ll make an excellent hitter, even though it will require moving him to another position to make it happen. Of course, it would have been impossible for d’Arndaud to come up, since he was on first base. (Cespedes was on third and Curtis Granderson was on second.) Given that, Johnson was the best we could have hoped for, and he delivered. The Mets close out their series against the Marlins tonight with Jacob deGrom starting against Jose Urena and, with any luck, a bunch of September callups in the Marlins lineup. There’s no question that the Mets have had a different season than we expected. Part of that is due to the unexpected injuries to our pitching staff – this would be a different season if Matt Harvey had been healthy, if Zack Wheeler had recovered more quickly, if Steven Matz had been consistently himself – but part of it is due to the Mets’ run-scoring. In the regular season of 2015, the Mets were shut out 15 times, a little over 9% of their games. That’s higher than this year’s 9 shutouts, which are just a shade under 7% of their games so far. Still, the Mets had more high-scoring games last year than this year, as well: about 6.8% of games scored double digit runs in 2015, versus 5.3% this year. 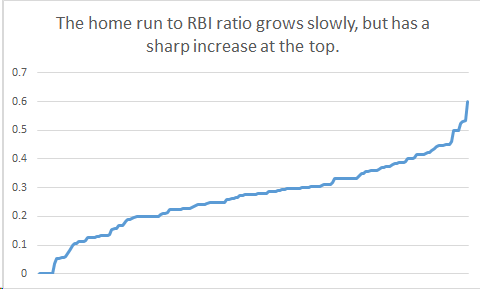 The Mets scored 4.2 runs per game last year, and that’s dropped to 3.9; all this is happening while the average runs per game in the National League is rising, so the impact of that .3 R/G is amplified. Finally, last year, the Mets spread their run production; the standard deviation of runs per game was about 3.25, versus 2.9 this year. To put it differently, this year fewer runs are being scored, and they’re having fewer blowout games. 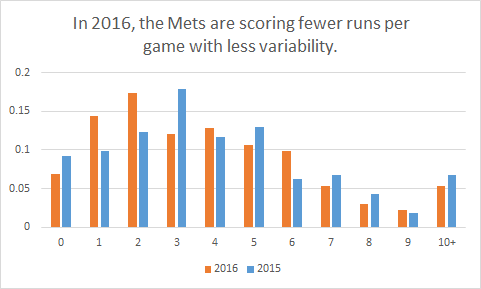 A lower level of variability would be an improvement if the Mets hit more, but as it stands their consistency is harming them. Bartolo Colon starts tonight against right-hander David Phelps. Yoenis Cespedes, who has as many home runs as Lucas Duda had all season last year, is 2-12 with 2 walks against Phelps, while Jay Bruce has hit 3-7 and walked three times. James Loney has a .333 OBP facing David, while Wilmer Flores has a .400/.429/1.000 slash line in 7 plate appearances. Even Bartolo has a hit in three at-bats against Phelps. Having held down the last two games with shaky starters, it would be criminal for the Mets to collapse in a game like this. As long as Terry Collins finds a place to stash Flores, as long as Jay Bruce brings his old self with him, as long as Asdrubal Cabrera or Jose Reyes hits the way he has against Phelps in the past, this should be strong performance for Colon. Though current Marlins have hit him well, he can hold it down until Jerry Blevins, Addison Reed, and Jeurys Familia can finish the game off. The Mets open a four-game series against the Marlins tonight. The Marlins are 8 games behind the first-place Nationals with a magic number of 25; the Mets can be eliminated from NL East contention by any combination of wins by the Nationals and losses by the Mets totaling 24. With 32 games left for each of those teams, even a .500 finish by the Nationals would require the Mets to go 25-7 over the stretch. That means nearly 4 wins for every loss – difficult to achieve. Meanwhile, the Mets are 2.5 games behind the second wild card in the NL (St Louis) and 5 games behind wild card leader San Francisco. Since overtaking the second wild card necessarily involves passing the Marlins, this series is crucial – up to an 8-game swing hangs in the balance. 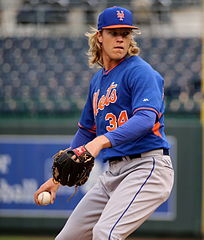 Surely, the Mets are bringing their best hurlers, right? 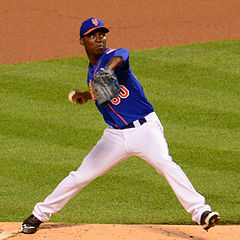 Rafael Montero starts for the Mets tonight against Jose Fernandez. In 24 games in relief for AAA Las Vegas, Montero has a 6.54 ERA. Although that’s a bit inflated, he’s still got a 2.95 ERA at AA Binghamton, and has started only twice. Montero is, of course, a bit of a sore spot for Mets fans after Terry Collins_going_to_see_injured_ra.html”>taking most of last season off. With Montero’s depth in question, and with him making his first major league start of the year, the Mets’ bullpen will be crucial. However, Josh Smoker and Jim Henderson each pitched both of the last two games; Hansel Robles has had a difficult August following a fantastic July, carrying a 10.38 ERA in 13 innings over 12 games. Addison Reed and Jeurys Familia are both available, and Jerry Blevins pitched only 2/3 of an inning last night, but otherwise the bridge to the 8th inning will be Sean Gilmartin. With Seth Lugo starting tomorrow’s game, this is a crucial win for the Mets. Tomorrow, Henderson and Smoker will be rested and Terry Collins will have a bit more flexibility. If ever there was a time for Montero to dig deep, it’s today. The Mets are idle on Monday but begin a homestand on Tuesday against the Arizona Diamondbacks. They’ll also see the San Diego Padres before heading to Arizona to face the Diamondbacks and play a four-game series against San Francisco and three against the Cardinals. The Dbacks are notable as one of the most right-handed lineups in the majors. Arizona’s left-handed batters have made only 1149 plate appearances as of Sunday morning; for comparison, the Phillies have had 1896, Miami 1477, Washington 1881, and Atlanta a whopping 2386. Fortunately, the rotation is leaning toward some of our least effective starters against lefties. Although Tuesday night starter Steven Matz is a southpaw, he takes a beating against lefties. He allows a .308 OBP to righties but a .348 OBP against left-handers. Wednesday night starter Bartolo Colon is about even (.298 OBP regardless of handedness), and Thursday afternoon starter Noah Syndergaard allows a .333 OBP to left-handers but holds right-handers to a .257 mark. Outfielder Jake Lamb is likely to be the hardest lefty to get rid of. Fortunately, Erik Goeddel has held lefties to a .219 OBP in 32 plate appearances (.220 vs right-handers in 59 PA). Goeddel has really been a sleeper for the Mets this year, although those numbers are deflated a bit by a lower-than-average BAbip. That means that the Mets can confidently use Goeddel regardless of the arrangement of batters. In addition, traditional LOOGY Josh Edgin is available for crucial outs, even as alleged left-handed specialist Jerry Blevins has allowed a .275 OBP to left-handers against a .250 OBP to right-handers. Future Mets closer Hansel Robles has continued his weird reverse split; he’s holding lefties to a .272 OBP while allowing a .333 OBP to righties (inflated a bit by a high BAbip). That’s not as good as Addison Reed (.193 vs RHB, .262 vs LHB), but it’s still fairly solid. Robles, incidentally, is 5-0 with 3 holds and a 2.28 ERA on a very slightly high BAbip since his 3 2/3 of relief for Bartolo Colon. Although he melted down against Mark Teixeira, he’s still maintained a 3.0 KBB ratio in those last 16 games. 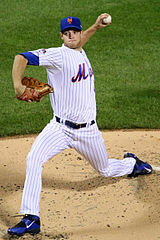 Steven Matz. Photo: Arturo Pardavila III via Wikimedia Commons. After two rough outings including notching a condor win and allowing the winning runs in a tied ballgame, Jeurys Familia was back to his old form on Monday afternoon. Familia pitched a perfect ninth, striking out two, to save Matt Harvey‘s seven innings of shutout baseball. Harvey’s last regular season sniff of the seventh inning came on August 11 of 2015. Addison Reed also showed closer-level stuff, striking out two in a perfect inning of his own. Jim Henderson and Jerry Blevins were warmed up in case of emergency, but the game was otherwise a B-squad gem, with solid defense from Alejandro De Aza, Ty Kelly, and especially Wilmer Flores during their rare starts. The series against the White Sox continues Tuesday, with Steven Matz seeing most of the White Sox for the first time. Todd Frazier is 1-6 against Matz and Austin Jackson is 0-1; meanwhile, many of the Mets have hit against Mat Latos with mixed results. Neil Walker has a .280/.400/.560 line, owing to 4 walks and 2 home runs in 20 plate appearances. Yoenis Cespedes is 0-5, while De Aza and Juan Lagares have had a bit more success. Lefty James Loney is expected to start at first base; he’s hit Latos at a .350 clip with 2 home runs in 20 plate appearances. Eric Campbell is 2-4 with two walks against Latos, for a monster .750 OBP. With Lagares quite successful, expect him to get the start and Michael Conforto to sit as a pinch hit threat. As this was being written, the Mets hadn’t announced who they’ll send down to make room for Loney. I think the right move is to keep Kelly as the second-round pinch hitter behind De Aza to allow Campbell to play every day in Las Vegas. Kelly runs reasonably well and with Flores back up we don’t have as imminent a need for an infielder who can play shortstop. With a seven-man bullpen, and with roles well-defined, sending down a reliever is a bad move at this point. With David Wright possibly headed to the disabled list due to a herniated disc, Flores may get the start at third; Ty Kelly or Eric Campbell is likely more useful off the bench to enable a double switch or as a pinch runner. That opens up another option to make room for Loney – keep both Campbell and Kelly, but put Wright on the disabled list. Whichever direction the Mets go, they built up quite a bit of momentum against Jose Quintana on Monday. The White Sox’ anemic hitting, Matt Harvey’s strong start, the bench’s solid performance in the field, and Jeurys Familia pulling himself together mean that they should be able to knock Mat Latos out of the box early and gain on the one-game lead the Nationals currently hold. The Nationals won 4-3 against Philadelphia Monday night; they see the Phillies again Tuesday. Tonight, Noah Syndergaard takes the mound against the Dodgers’ Kenta Maeda. The Mets enter tonight’s game 3-2 on the season against the Dodgers, following a near miss by normally lights-out closer Jeurys Familia. The Dodgers’ Chase Utley has been, frankly, ridiculous this year. Utley has been producing in key positions for the Dodgers. After last year’s disappointing .212/.286/.343 season, Utley has raised his batting average to .292 and added almost a full .100 to his on-base percentage (chiefly by walking more). Utley is dangerous on base, scoring a run over 40% of the time. Though there’s speculation that Syndergaard will murder Utley, the Mets seem to have made their peace with him and are letting the fans exact his punishment – although, frankly, he’s batting in so many runs that I wish they’d just hit him instead of giving him the chance to clear the bases. However, Syndergaard has had his way with Utley. In 8 plate appearances, Utley has only gotten on base once – a single. Noah has been similarly effective against Howie Kendrick (1-11), Yasmani Grandal (1-7), and Yasiel Puig (1-6). On the other side, former Met and current troll doll Justin Turner has been successful (2-6, both doubles). Enrique Hernandez is 1-1 with two walks, one intentional. 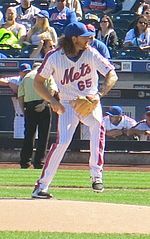 As for Maeda, Mets fans may recall him as the dude Noah hit two home runs off of a few weeks ago. Other Mets haven’t been as effective: Michael Conforto, Neil Walker, and Asdrubal Cabrera are each 1-3, but no one else has hit him. This one is going to require Syndergaard to pitch effectively and our batters to leave it on the field. Syndergaard’s numbers versus current Dodgers are below.